Ant Heeks gives us an in-depth review of a very special weekend for Tyketto fans. Tyketto have become regular visitors to these shores in recent times, with at least one tour a year interspersed with Festival appearances, but for 2018 they decided to do things differently and create a special event for the fans, so the idea for 'An Evening With Tyketto' was born. 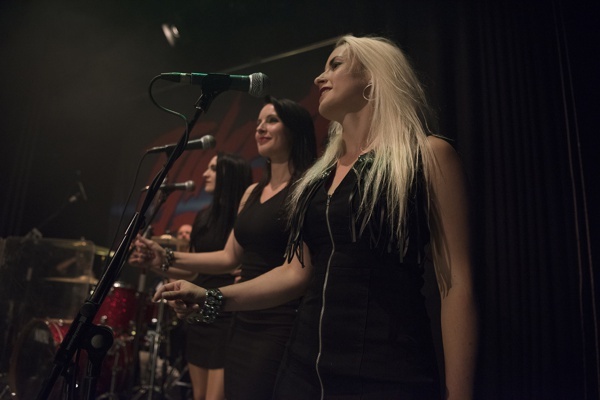 The premise; take over a venue for an entire weekend and perform a number of songs from throughout their career, but with a different twist to what we're used to, like adding extra elements such as a string section, a brass ensemble and a trio of female backing vocalists, or complete rearrangements and reinterpretations of much-loved Tyketto songs. Not only that, but the entire event would be filmed for a live DVD/CD and each evening will end with a full buffet dinner for band, crew and audience to enjoy together. Needless to say, this was one event I could not miss. I was aware that there had been some discontent with some parties regarding the cost of the tickets for the event, plus the location being somewhat out of the way, but bearing in mind that the price for the weekend included four Tyketto live sets, an opening support slot each day from Kane'd, the DVD package for every attendee and the buffet dinner, it made for a worthwhile investment. Additionally, it also meant that this wasn't really an event for the casual fan, ensuring that the audience was exclusively made up of Tyketto diehards who completely entered into the spirit of the weekend. As a huge fan, lead vocalist Danny Vaughn very kindly invited me and my wife Izzy along to attend the final rehearsals, which I very gratefully accepted, so on the Friday before the show we made our way down into South Wales and Pontypridd in the Rhonda Valley. The Muni Arts Centre is actually a very beautiful building, formerly a chapel built in 1895, and a perfect venue for the weekend. Upon arrival it was especially touching to be so warmly welcomed by Danny, drummer Michael Clayton Arbeeny, guitarist Chris Green and keyboardist Ged Rylands, four gentleman who have become very good friends to us. It was also our first chance to meet current bassist Greg Smith; with Chris Childs once again on Thunder duty, Greg has become his regular stand-in, and we later learn that he was actually in a band with Danny back in the early eighties, and though they drifted apart they re-connected many years later on a Monsters Of Rock Cruise when Greg was in Ted Poley's band. The auditorium itself was a nice intimate size, and instead of rows of seating there were twelve tables with about ten chairs around each one, all smartly decorated with black tablecloths and candles, and while I initially thought it was an unusual arrangement for a Rock show it actually served to produce a very sociable and interactive setting. On the stage was a beautiful black grand piano (courtesy of Yamaha), while Michael's drum-kit was surrounded by a Plexiglass screen (to prevent musical bleed for the recording purposes), all dominated by the backdrop of that wonderful Tyketto logo. Chris invited us up onto the stage to see the layout at close quarters and see how it looked from his perspective. To enhance the setting, somebody had been sent out to the local Ikea store to purchase some rugs for the stage, along with some smart column lamps to create some ambience – Ged admitted he was intent on taking them home with him afterwards... The cameramen for the event were already in attendance to set up their equipment, while the sound and recording was handled by the sound engineers from the nearby Rockfield Studios (where the 'Reach' album was recorded), Nick Brine and John Constantine – John was an absolute bundle of energy all afternoon as he was constantly backwards and forwards from the stage to the mixer, ensuring that the sound levels were absolutely perfect through the insane amount of monitors and equipment required. 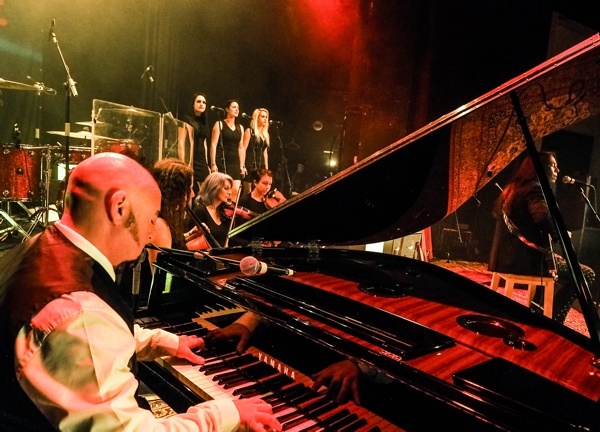 While various equipment was being readied, Ged was tinkling away at the piano, playing some lovely melodies that were instantly recognisable as Tyketto songs – it was beautiful to hear them in a gentle, piano-only format. The whole band had been intensely rehearsing all week with the Kane'd sisters Stephanie, Cheryl and Stacey to perfect the backing vocals, and all of the guys were keen to emphasize just how hard the girls had worked on their contributions, so then Izzy and I are then treated to a preview of pretty much all of the songs that would be performed over the weekend, demonstrating just how much hard work had been put in with the new arrangements of the songs as proceedings went very smoothly. However, at 6 o'clock the six backing musicians arrived to join the band for the first time. Emma Bryden (cello), Elizabeth Prendergast (violin), Sue Lord (viola), Laura Potter (saxophone), Alex Linton (trumpet) and James Davies (trombone) all joined the band onstage for a brilliant run-through of the new version of 'Lay Your Body Down', and though it wasn't perfect it was still pretty damn good to my ears, incredulous to think that this was actually the first time that the whole ensemble had actually met in person, let alone performed together! Emma Bryden had been completely responsible for all of the string and horn arrangements and deserves a lot of the credit for her contributions to making already brilliant songs even more impressive. By the time the rehearsals are complete, I realise that seven hours had passed since we arrived! When Danny came to say goodbye he said "you didn't get bored then?" Bored? Not a chance! The highly enjoyable afternoon and evening with a sneak preview of the exciting new arrangements had absolutely heightened the anticipation for the main event. So as 2pm Saturday arrived, the Muni rapidly filled up with an army of eager Tyketto fans, and the first hour was spent in a very relaxed manner as everybody mingled, all getting to know the other people seated at the same table while old friends that have been following the band for years caught up with each other. The idea of using the tables was a brilliant one as it created a very cordial atmosphere, and the informal setting meant many new friendships were created over the course of the weekend. At 3pm the curtains across the stage opened to reveal a very smartly dressed Danny Vaughn who explained the reasoning behind the creation of this special event, paying tribute to everybody involved in the weekend from the musicians to the Muni staff, and also requesting that everybody refrained from filming or recording any of the proceedings; as the professional cameramen and sound engineers would definitely do a better job and everybody in attendance would receive a copy of the finished article anyway, this request was willingly acquiesced. Danny then acknowledged the effort demonstrated by the Kane sisters in their contribution towards the show and introduced the seven members of Kane'd to the stage for a thirty minute acoustic set. I wasn't familiar with their music but the opening song 'Beautiful But Tragic', 'La Di Da' and their version of He.a.t's 'A Shot At Redemption' were enjoyable, and they clearly won over the majority of the audience judging by the amount of people purchasing their CD's afterwards. Then at 4pm Danny once again appeared on stage to signal the start of the first Tyketto set. 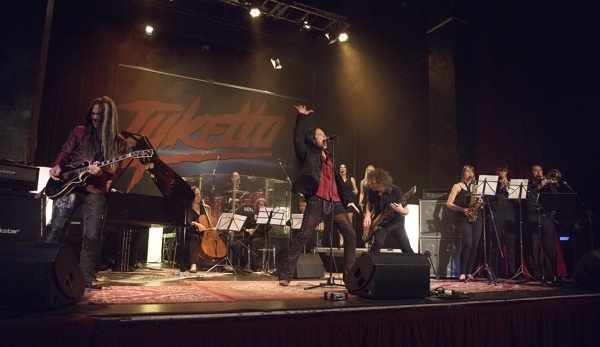 Each band member was rewarded an individual introduction, along with a background anecdote as to how they ended up joining Tyketto. All were impeccably dressed, especially Ged, in his white shirt, tie and waistcoat, very different to the normal T-shirt and Jeans worn for a regular Rock 'n' Roll show. It was evident that this was not going to be a typical warts-and-all concert recording and very much a civilised, professional performance. We were made aware that there would be extended breaks between the songs to alter the stage setting to accommodate the relevant additional instrumentalists required, and also that some songs would be repeated to enable the cameras and sound to obtain the perfect take. This was very much welcomed by the audience and, one inconsiderate person aside who insisted on talking through the entire show and dancing around (during a highly emotional version of 'Standing Alone' for Christ's sake! ), everybody embraced the spirit and intent of the event and behaved impeccably, only getting to their feet to acknowledge the more sublime moments and reward the band with a number of well-deserved standing ovations. Now I'm not going to reveal too many specific details here of each individual song's re-arrangement that was performed over the whole weekend, as I really don't want to spoil some of the surprise for anybody who was unable to attend the show and intends to buy the DVD – but needless to say you won't be disappointed. 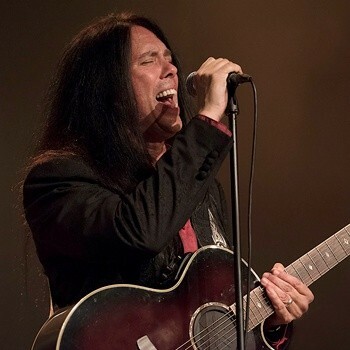 Regular attendees at Tyketto shows are used to the acoustic 'The Last Sunset' being an encore number preceding the big finish of 'Forever Young', but today it opens proceedings in a brilliant, livelier full-band version, with only the lyrics making it familiar. 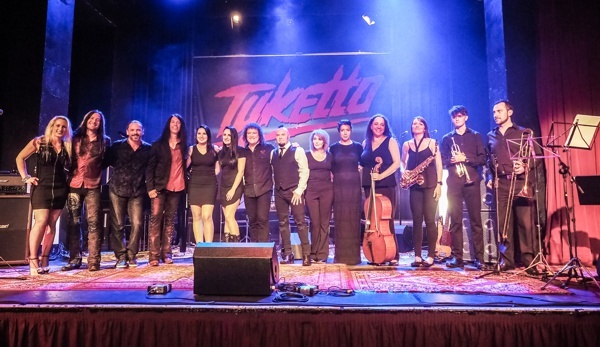 The intimate and civilised setting, and indeed the augmentation of the accompanists, really emphasized the slower songs of Tyketto's catalogue and it's fair to say a lot of ballad-orientated songs were included. When I say ballads... everybody knows that 'Forever Young' is an absolute, all-time classic Hard Rock anthem, yet the version performed this weekend was slowed down and stripped back to just Chris' acoustic guitar, Danny's sublime vocal, the female backing vocals and Emma's cello – the result was sheer, spine-tingling magnificence. 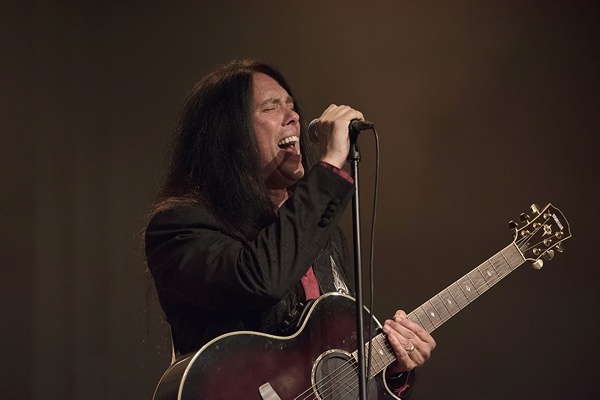 The exquisite 'Standing Alone' also emphatically made its presence known, as did a stunning version of one of Danny's solo songs, 'The Voice' (from the 'Soldiers And Sailors On Riverside' album). The two ballads from the 'Reach' album were also played, with the sweeping string section taking the powerful 'Scream' to an even higher plain, while the entire fourteen-person entourage delivered a breathtakingly stunning 'Letting Go', complete with a rousing, symphonic finale. And while the more reflective numbers assumed a healthy portion of the weekend's proceedings, there was still plenty of opportunity to rock out. For instance, the emphasis of the string section gave 'Faithless' an even more dynamic, Led Zeppelin 'Kashmir' feel and increased the heaviness of the song, and the fast-paced final section of 'Love To Love' saw Chris Green deliver a jaw-dropping, finger blistering solo that earned a very well-deserved ovation (he then had to repeat the feat for the second take and got an even bigger cheer!). The soulful 'I Need It Now' included a mid-section breakdown that gave the each of the three backing vocalists a turn in the spotlight – (when I heard this part I couldn't help but think of Pink Floyd's 'The Great Gig In The Sky', later when I was talking to Chris Green he mentioned this song and said "we were going for a 'Great Gig In The Sky' kind-of vibe"... job done then! ), while an even groovier version of 'Lay Your Body Down' than normal saw special emphasis on the horn section. I mentioned that we had been made aware that some of the songs may be performed twice, and indeed a lot of them actually were – sometimes because the band felt that once the initial nervousness of delivering a different interpretation of the song had been dealt with, a second, more relaxed take would be an improvement, but sometimes because the vibe was so good (and it is somewhat unlikely they will ever be performed in this style again) they just couldn't resist another run-through. Indeed, the second take usually was the slightly superior version, and I didn't hear any dissent to any of the repetition - I think the vast majority of the attendees approved! Both days performances followed a similar timetable (with just the planned songs varying each day), including Danny's welcome for the benefit of anybody who didn't attend the Saturday show, the Kane'd support set, and the band introductions, though during the Sunday performance Ged, Chris, Michael and Greg each took a turn introducing a song to give Danny's voice a break. However, once all the rehearsed songs had been performed on Sunday afternoon, with a little time left, just the five Tyketto members returned to the stage, completely unplanned, to close the show "old-school" style; as the only album not plundered for material that weekend was 'Strength In Numbers', we were treated to awesome versions of 'Catch My Fall' and 'Meet Me In The Night' to bring the curtain down on an immensely enjoyable weekend. It was the general consensus that the entire weekend had been an amazing success. Hearing brand new, often highly moving versions of endearing Tyketto songs certainly evoked a lot of feeling within the audience. Many tears were shed, emotions ran deep, but ultimately long-lasting friendships were formed. Everybody I spoke to agreed that it felt like a real privilege to be part of such an event. This was so much more than a Rock concert, this was a very special celebration of wonderful music that will last long in the memory of the Tyketto fans who were lucky enough to attend. To all the staff at the Muni for being so friendly and accommodating to everybody in attendance – and the great buffet! To the nine additional musicians and singers for helping to breathe new life into much-loved Tyketto songs. To Nick Brine and John Constantine for the perfect sound quality throughout the whole weekend. To Marty Moffatt and Lindsay Smith-Boam for the excellent photographs. And finally to Danny, Michael, Ged, Chris and Greg for creating a very, very special weekend for Tyketto fans – I really don't know how you will top this one guys.